Salon professionals who are new to Instagram — or social networking in general — are sometimes shy when it comes to posting photos of their work, notes Jason Olsen, co-founder of Utah-based Image Studios 360. He counsels timid social media users not to underestimate their abilities. “Take pride in how far you’ve come and have faith in how far you can go. Your clients love you for a reason,” he says. Image Studios 360 offers comprehensive business support to the professionals leasing salon suites at its five locations, including social media training. As part of that effort, Olsen offers the following tips on how to use Instagram most effectively. > Follow and be followed. Before you can start making an impression, you’re going to need followers. Spend some time following as many people as you can (especially people who fit your demographic), since many users typically “follow back” those who follow them. Be patient though, it takes a few months to build a solid network of followers. > Take it slow. Nothing is worse than following a technician who decides to post 25 photos in five minutes. You may be excited and want the world to know it, but limit yourself and share only your best photos. It enriches your followers’ experience and benefits you. If you’d like to combine photos, apps like Diptic and Fuzel can create a collage. You can export them straight to Instagram to make photos even more attractive by telling people a story. > Pump the stock brakes. No one wants to see that stock photo you took a screen shot of on your iPhone and posted as your own. They’ll quickly unfollow you if you ever post photos that are stock images. Just don’t do it. Ever. > Choose your hashtags wisely. Understand that hashtags are not bullet points to your photo or post, but are ways to search what’s trending online. Use hashtags as keywords for what your photo is about and have two to three hashtags that you use as your own. Then use your personal hashtags every time you post a photo. > Involve your followers. Brands such as Red Bull and Audi have mastered creating communities on Instagram. They use hashtags and run Instagram contests that get users to interact with their products and brands by connecting to their lifestyle and emotions. 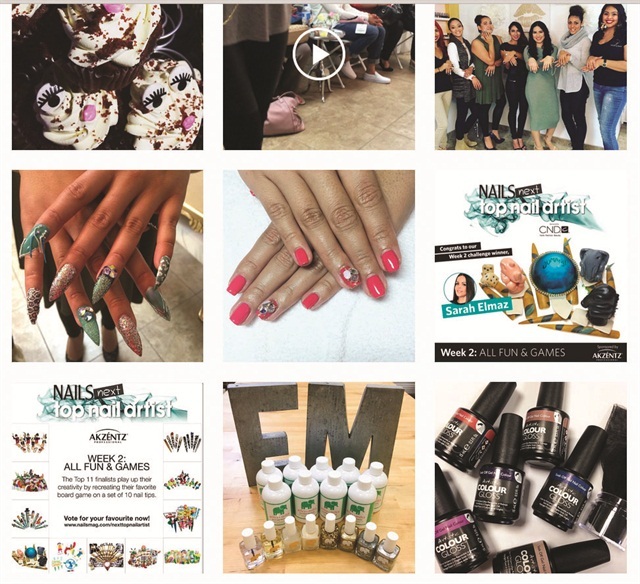 You could give away a gift card to clients who post photos of their nail art. Make sure your clients use one of your hashtags so you can track it. > Comment back. It’s important to interact with people on Instagram. It’s a network largely based on the emotions that a photo evokes, and those emotions inspire conversation (in the form of comments) regarding your photos. Try to make communication a two-way street and people will be excited not just to follow you, but to interact with you. Most importantly, look for comments that may show interest in booking an appointment with you. There is gold hidden in Instagram comments! For more information on Image Studios 360, go to www.imagestudios360.com.